We take care of EVERY detail of your silent auction. NO COSTS! NO FEES! NO RISK! We make you the most money! If you have any more questions, please call (416) 733-2344 or email us. 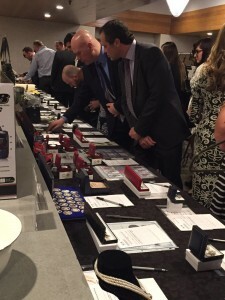 AFGI – Canada’s Top Silent Auction Fundraising Experts! We offer a full service providing professional management of your silent auction. Managing every aspect of your Silent Auction. We will consult with you every step of the way providing expert advice. We have a very well trained crew to set up and tear down your silent auction so you don’t have to worry about that process. AFGI provides you with a large assortment of silent auction items tailored to your audience and event theme. We take into account all of the price ranges, including event specific items and customized one of a kind items. We have mastered the professional and attractive display for all of your silent auction items. This includes displaying silent auction items donated for your specific event. There is a no-charge inclusion of all silent auction items donated for your charity or fundraising event. Our professional, friendly and efficient staff will be present and available for questions, assistance and service throughout the entire silent auction. They will manage all of the bid sheets and opening bids. We have mastered a quick and efficient check-out process with the latest wireless POS technology and you will receive a very detailed summary of all bids as well as a final reconciliation. For all donated items, your charitable cause receives 100% of the proceeds under our professional management. For all items provided by AFGI, you are our partner from the moment the first bid is placed and we guarantee you a percentage of the final highest bid price; we spare you the scenario of anxiously waiting for multiple bidders to ensure your charity makes money. The percentage we provide to the charity is more than fair, as are our opening bids. Our competitive prices are due to tremendous buying power and the expertise of our professional buying team whom continuously source proven products. AFGI charges no external fees for our services and we pay a higher percentage of the final winning bid price to charities. We encourage you to compare our services. With AFGI, your charity will receive more money than any other auction company offers. All you need to do is deposit the cheque – we’ll handle the rest! What kind of items can you expect AFGI to supply? Artwork, Women’s and Men’s Jewellery, Collectibles, Electronics, Genuine Sports and Hollywood Memorabilia, Designer Décor, Experience Packages, Nostalgia, Numismatic Collectibles (Coins, Banknotes, Silver & Gold Bullion), Event-Customized Goods and Other Unique and Allied Items. We will work with your team to choose successful items based on your expected attendee demographic, theme of your event, donated items and our expertise.